OAKLAND, Calif. -- Mike Fiers felt the adrenaline pumping early in his first day on the job with his new team, and he put it to good use. Fiers pitched 5 1/3 strong innings and the Oakland Athletics beat the Los Angeles Dodgers 3-2 on Wednesday night. Fiers gave up one run on four hits. He struck out eight and walked none. "I think it kind of stepped up another level today," Fiers said. "Just trying to put together a good performance for this team. Definitely needed it after losing last night. We needed to come back with a win and we did that." Fiers didn't allow a baserunner until Yasmani Grandal led off the fifth with his 20th home run. Fiers was with the Houston Astros when he pitched a no-hitter against the Dodgers on Aug. 21, 2015. The A's, desperate to add depth to an injury depleted rotation, acquired the 33-year-old right-hander from the Tigers on Monday for two players to be named or cash. He became the 13th starter the A's sent to the mound this season. Fiers and battery mate Jonathan Lucroy were teammates on the Milwaukee Brewers from 2011 to 2015. "He did well," Lucroy said. "He executed. Any time you can do that it gives your lineup a chance to settle in, even against a guy like Kershaw. We scratched two on him. If Fiers isn't keeping us locked in there for as long as he did I don't think we score those two runs." 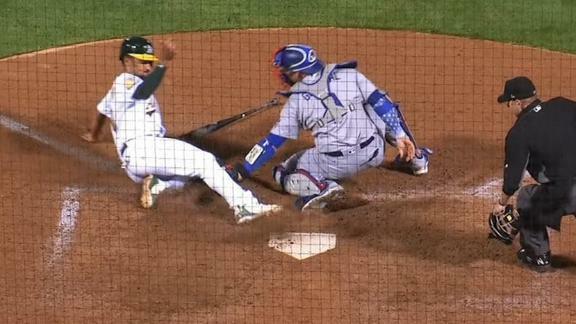 The A's broke a 2-2 in the eighth inning when Khris Davis hit a fielder's choice grounder off Dodgers reliever J.T. Chargois (2-3), scoring Marcus Semien from third. Dodgers third baseman Manny Machado fielded Davis' bouncer and fired home to catcher Grandal, but Grandal never had control of the ball when he swipe-tagged Semien. Grandal was charged with an error on the play. "It's going to be one of those plays where it's going to be a bang-bang play, and if you happen to have to have the ball in your hand he's out, and if not he's safe," Grandal said. Second baseman Lowrie made a running catch with Yasiel Puig at second for the final out to preserve the win. Oakland won for the seventh time in eight games and improved to 34-11 going back to June 16, the best record in the majors over that stretch. The A's closed to within five games of idle Houston, which leads the AL West. The Dodgers fell a half game behind Arizona, which beat Philadelphia on Wednesday to move into first place in the NL West. Dodgers ace Clayton Kershaw gave up two runs in six innings. He remains winless in four starts against Oakland despite posting a 1.38 ERA over that stretch. Kershaw is 2-1 with a 2.10 ERA since the All-Star break. "I didn't have much of anything tonight," Kershaw said. "It was a little bit of smoke and mirrors. That's a good team over there and I was getting ahead of a few guys, but especially that fourth inning where they scored the runs, a lot of hits with two strikes right there, I didn't really have those put-away pitches when I needed them to tonight." Dodgers: LHP Hyun-Jin Ryu (left groin strain) pitched in a rehab game for Triple-A Oklahoma City on Tuesday night. He threw 71 pitches and topped out at 91 mph, Roberts said. Ryu throw again in five or six days, possibly for Los Angeles, manager Dave Roberts said. "To Ryu's credit, he pitched well, he feels well, and so to make our decision more difficult, that's a good thing for the Dodgers," Roberts said. . LHP Alex Wood (left adductor tendinitis) pitched three innings in a simulated game on Tuesday. "At that point we'll figure out where to plug him in," Roberts said. Dodgers: Ross Stripling (8-3, 2.68 ERA) will come of the DL (right first toe inflammation) to pitch Thursday's series opener against the Rockies in Colorado. He's 1-1 with a 2.88 ERA in 10 appearances (three starts) against the Rockies. Athletics: LHP Brett Anderson (2-3, 4.64 ERA) will pitch Friday's series opener against the Angels in Los Angeles on Friday. Anderson is 2-1 with a 2.96 ERA since coming off the DL (strained left shoulder) on July 8. Marcus Semien scores the go-ahead run on a fielder's choice after Yasmani Grandal drops the ball at the plate.